Clinical psychologist and host of At Home with Chuck & Jenni, Dr. Chuck Borsellino offers practical insight into why parents "fib" to their children-and provides alternatives so you can raise your kids in a world based in reality. 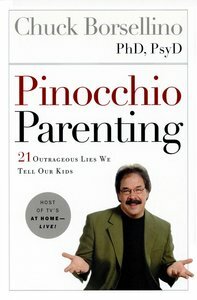 Are you a Pinocchio Parent? You may be asking yourself these very questions: What lies, clichés, and half-truths do I tell my children? How do these lies hurt my children and my relationship with them? Clinical psychologist and author Chuck Borsellino claims that our culture condones all sorts of lies-from tiny fibs to calloused misrepresentations. Though well-intentioned in our unintentional lies, we set our children up for failure and disappointment and undercut our credibility. In the pages of this book, Dr. Chuck Borsellino helps you sort out fact from fiction, intention from outcome. Most importantly, you'll learn a better way to help your children live life within the bounds of reality while fully exploring the dreams of their heart.